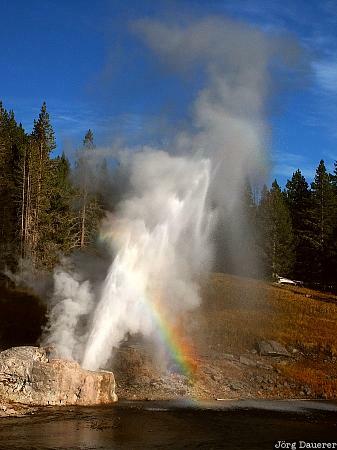 A rainbow appears during an eruption of Riverside Geyser at the Upper Geyser Basin in Yellowstone National Park. Yellowstone National Park is in the north-west of Wyoming in the western part of the United States. This photo was taken in the afternoon of a sunny day in September of 2003. This photo is part of the exhibition Rainbow (February 2017). This photo was taken with a digital camera.